In more ways than one, Kong: Skull Island serves as a direct counterpoint to 2014’s dark and grounded Godzilla. 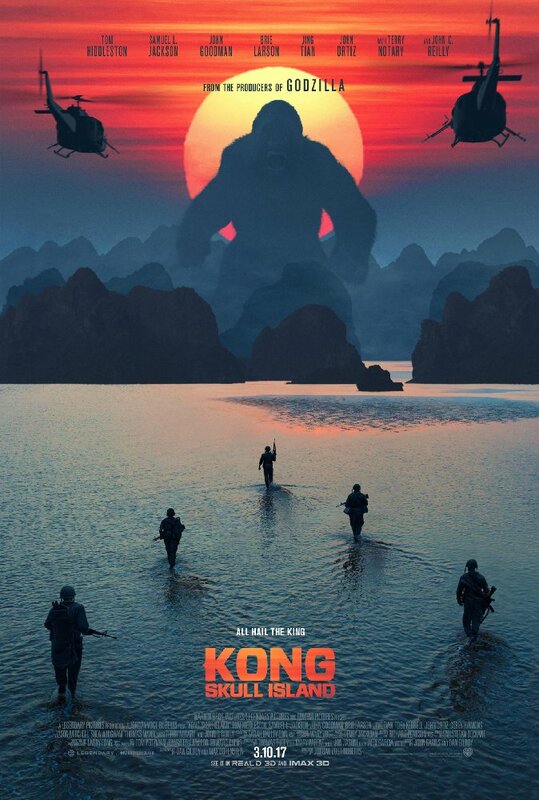 This is an extremely loud film, both in its levels of visual bombast and its starburst theatrics, meshing the utter silliness of big monster movies with the traumatic outcomes of a Vietnam War epic. That’s quite an ambitious combination, although the results tend to err more towards descriptions like stupid and/or sloppy instead of visionary and/or sharp. 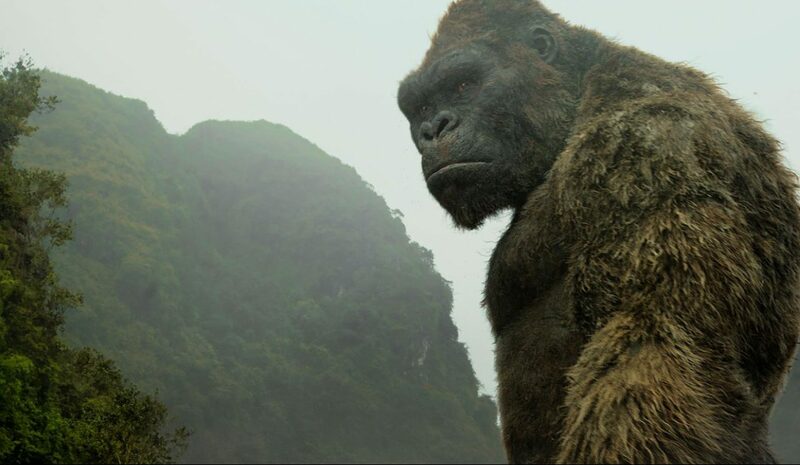 By placing the beast front and center with no connection to the desultory human characters, Kong: Skull Island takes on its title’s insinuation, delivering a beautiful looking skeleton without a head or a heart or any sort of muscle memory. Perhaps the biggest detriment is the size of this massive cast. It’s an impressive assembly of talent to say the least, but there’s little to no chemistry between them, and more often than not they’re quartered off into subgroups rather than gelling as one cohesive unit. 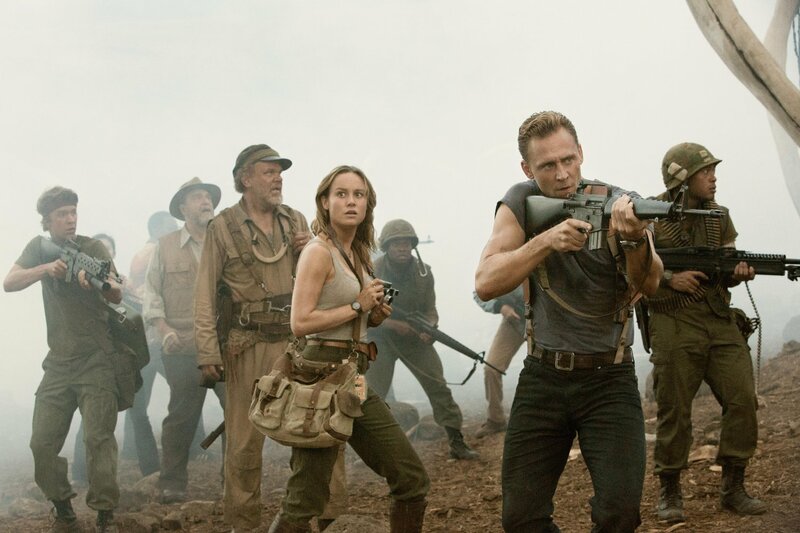 Bill Randa (John Goodman) works beside geologist Houston Brooks (Corey Hawkins), both wanting to explore “a place where myth and science meet.” Tasked with getting them to the uncharted island is Colonel Preston Packard (Samuel L. Jackson) and his fleet of pilots, as well as tracker James Conrad (Tom Hiddleston), famed photographer Mason Weaver (Brie Larson), and a handful of scientists. What awaits them is sheer beauty. An ecosystem of waters and mountains and stretches of green land. But this previously unseen and unheard of world is a rose with thorny creatures lurking around every corner, and a giant ape who maintains order. Praise the heavens for John C. Reilly’s maniacal and hilarious performance as an island castaway, or else I think I might have shut this movie out altogether. 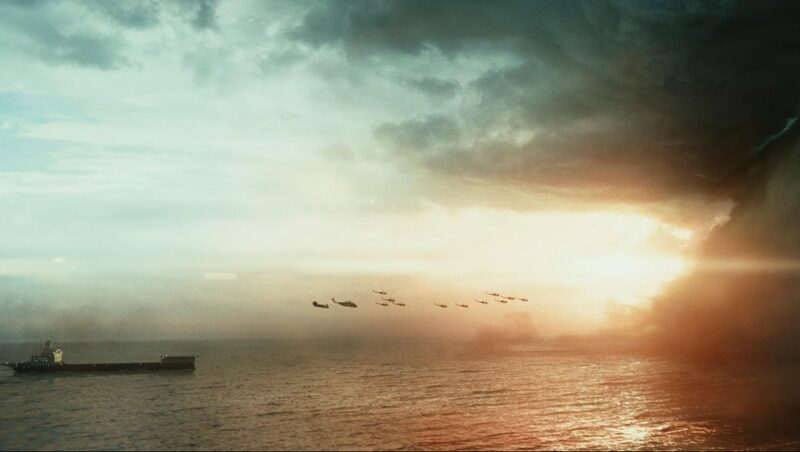 As evidenced by the above shot, director Jordan Vogt-Roberts has seen Apocalypse Now. After the choppers fly into a hellish landscape, classic 70’s anthems rock out one after another for the remainder, not out of necessity or for thematic relevance but as a foolproof reminder of when this film takes place. CCR’s “Bad Moon Rising” is practically synonymous with this time period in cinema. However, despite the breathtaking special effects, the solid production design, and the colorful cinematography by Larry Fong, Kong: Skull Island lacks any sort of resonance. To re-imagine the meaningless monster movies of the old days is one thing, but this one phones in a reservation for something more meaningful without ever actually showing up to devour the visual feast. As a relatively new filmmaker, Vogt-Roberts has all the tools and the techniques down, and I can understand why he was afforded this opportunity. He’s going to make greats movies, but this isn’t one of them. To compare, the film is like a hairdresser who knows how to dye and shape and layer any cut, but goes about it without restraint and does absolutely everything. It’s simply too much and fills the screen with more of a “look what I can do” mentality and less of an edited or artisan approach. My biggest critique of Gareth Edward’s Godzilla was that it simply did not embrace the fact that it was a monster movie. It focused on the shaky human relationships and was sorely misguided. Kong: Skull Island stands frighteningly tall as the polar opposite, previewing the ape in an early prologue sequence before seguing into 1973. Both films are visual wonders full of entertaining and skillfully choreographed set pieces, but neither has the missing parts to fill in the gaps of a narrative lost to spectacle. I loved this movie’s savagery and its scale and the upfront allowance for batshit hysteria. It works on that level, at least until it mistakenly goes for so much more, like scenes which harken back to pictures like Platoon and Casualties of War. Is this one long running satirical impersonation or a full-bodied creature feature packed with humor and hops? Kong: Skull Island doesn’t have an answer to that question, nor does it even consider such an inquiry. It’s self-centered and self-detrimental as a result, and only makes Peter Jackson’s glaringly forgotten 2005 film King Kong look even better than it already is.